This eBook contains 101 Pages brimming full of recipes, guides, tips, secrets and travel adventures. I've traveled the world collecting informative recipes and tips for ebooks and downloads all on barbecue grilling as its done in the far reaches of the earth. I've teamed that with great chefs and collected great bbq recipes, insightful stories and included the history of barbecue to make you a better barbecuer. Consider the fact that you'll never have to leave the comfort of your home or office to gain useful insight into Chinese, French, Japanese, Norwegian and many more forms of Barbecue Grilling. Just use this download eBook any time you want to open your world of knowledge. Titled from Bakersfield to Barbecue I provide you with some of my more comical homespun adventures as we make our way from California to Hong Kong, to Singapore, Australia, India and more. Over the years I've had the pleasure of eating in hundreds and thousands of restaurants, steak houses, sushi kitchens, tapas bars and fast food joints. Not just in America, but on all but two continents. And during that time I have had some incredibly amazing meals, along with some that are better left forgotten. In each case I found that the less complex the meal, the more memorable it was, for instance in places like Hong Kong, Tokyo and France. Places that focus on the subtleties of flavor over quantity and volume have made for a lifetime of great memories. Highlighting the world of global barbecue dining. I’m originally from a small town known for its cowboys, country western singers, Basque food and barbecues. That place is Bakersfield, California. Although not known as a social Mecca, Bakersfield has played host to Basque, French, Chinese, Japanese, African and Western style cooking, grilling and barbecues for over a hundred years. Many of the old west pioneers used Bakersfield as a way station for points north and further west. In fact a little known piece of history is how Bakersfield got its name. Essentially, when the Cavalry came through and drove back the outlaw Indians, one of the Cavalry’s colonels settled in the region, securing a large plot of land for crops and grazing. Travelers making treks through the Tehachapi and southern mountainous passes asked fellow travelers where they could stay and rest their horses. The travelers were told they could stay in “Baker’s field” which was owned by Colonel Baker. So, in time the way stop and later the town was named after its most prominent citizen. Following the expansion and growth of the town, periods of modernization took place including improving methods of farming, animal husbandry, socialization of indigenous cultures and the formation of ruling bodies. My family was transplants from Arkansas. And although arriving in Bakersfield at different times each side of the family brought with them their cultures, sense of community and appetites for food. All through this growth period the one main item that remained prevalent was barbecue and the gathering of families and friends for the celebration of birth events, new buildings and barn raisings. It is from this rich cultural heritage that my appetite for all things Barbecue developed. I’ve been the grill master at major family events for what has seemed like an eternity learning my skills from the transplants who knew what real barbecue not only tasted like but meant. 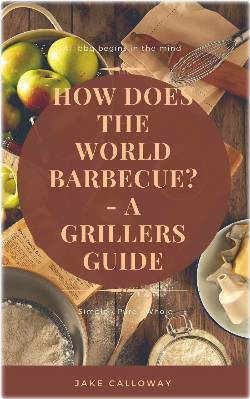 This Barbecue GrillerseBook download makes a wonderful reference book and is must have for anyone interested in expanding and growing their skills in the world of barbecue. This eBook is a **DOWNLOAD**. Click add to cart then confirm the order with your delivery information.